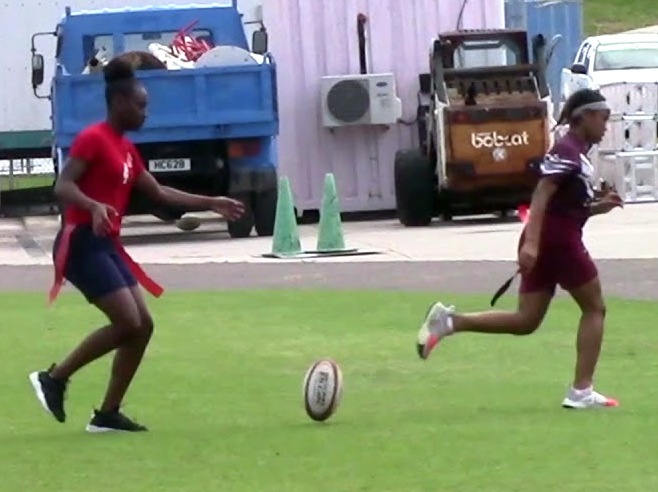 Sandy’s Secondary Middle School defeated a previously undefeated Warwick Academy 6 - 3 in the Tackle Division of the Bermuda School Sports Federation 2019 Middle School Boys Rugby Tournament. Jayson Simons led the Champions with four Try’s with Kieron Richardson adding two scores. Warwick Academy got Try’s from Kwame Naylor, Archie Richmond and Harry Twite. Saltus Red won the Girls touch Championships in an all Saltus Final. Saltus Red won a tightly contested final 2-1 over Saltus Whites. The Reds received Try’s from Kyra Adams and Caitlyn Brodie with Ramiah Brangman scoring a consolation Try for the Whites. Warwick Academy edged past Saltus 1-0 in the Boys Touch Final. Saltus Red had defeated Saltus White in the Semi-Final 7-4. Gibbons led the way with a hat-trick of Try’s while Soutter, Dylan Cooney, Braydon McKay and Aiden Kelly all scored a try each. Saltus Whites scorers were Michale Burcher, Johnny Bart, Declan Rearden and Tom Hyland. Warwick defeated Harrington Sound Primary 7-4 in the other Semi-Final with Jones scoring four Try’s. Max Kimberly scored twice and Noel Simmons once. Saltus Red won the Primary School Girls Final with a 6-5 win over Warwick Academy. Shanyah Smith and Avani Patton scored twice for the champions along with Evie Hook and Tse Burgess. Warwick had Nh’Lae DeRosa and Marliegh Howes score twice with Ayshalay Simons. Saltus Red defeated Saltus White 8-2 in the Semi-Final while Warwick Academy defeated Purvis Primary 4-3.